I've posted before about the great Facebook tag sales I follow. I've received a few emails asking me what this tag sale is all about. What tag sales are here in the Northeast part of the USA are what some people call garage sales or yard sales in other parts of the country and Canada. Someone on Facebook came up with this great idea and I've been able to acquire some really great pieces of furniture and some cool decor items as well. If you haven't started something like this in your town, well what are you waiting for?? Our tag sale groups are just that, Facebook groups that people ask to join or are invited to join. Now that I've gotten that out of the way, let's talk about my newest project shall we?? Or I guess I should put READ about my newest project. I can hear my English teacher talking in my ear. Oh would she have fun with my blog! A couple of weeks ago I got an email from someone who found my blog via one of the local Tag Sale sites on Facebook. From time to time I will post my projects on this site for sale. This sweet lady had seen a few of my items and went on my blog (Yippee!). She emailed me to say she had a dresser that used to belong to one of her children and when he moved out he didn't take it with him. She didn't want to see if I wanted to buy it, but rather see if I wanted it for FREE! I didn't realize nice people like this existed anymore! I was so touched she thought of me and felt that I was worthy of giving furniture to. I went a week later and picked it up from her and was thrilled when I saw it. It had great lines and was solid wood. I got to meet her and her sweet Husband and I think that's one of the things I love best about this tag sale site....all the interesting people you meet along the way. 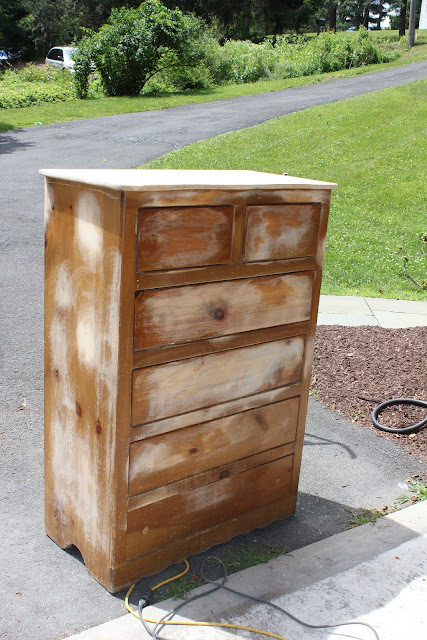 Here is the great dresser she gave me. 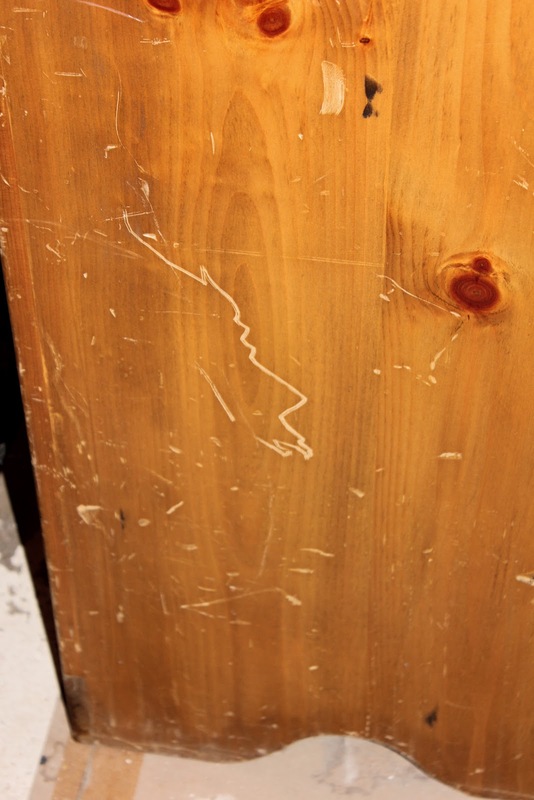 The finish was in rough shape and had a lot of carving in it, but that didn't matter one bit to me. 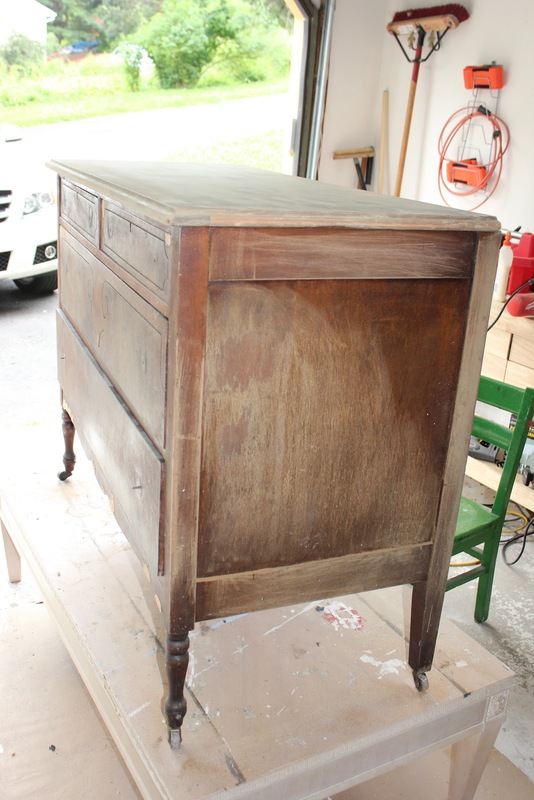 The top was the same as the front, lots of scratches, gouges and carving. 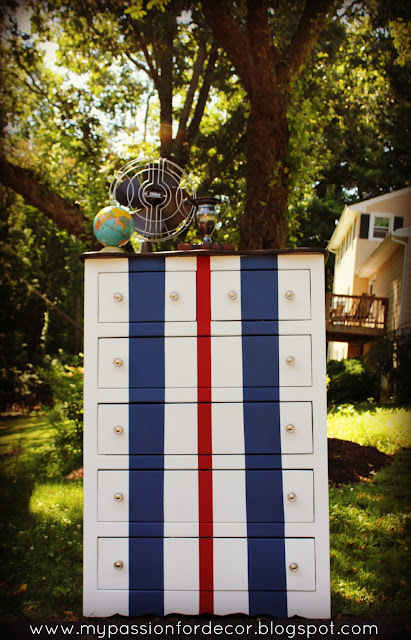 I had a dresser in the garage that was mine when I was a kid that I was going to paint for Hunter's playroom. The kid has way too many toys and needs more storage, but my old dresser only has 2 small drawers and one larger drawer so really not a big storage solution. 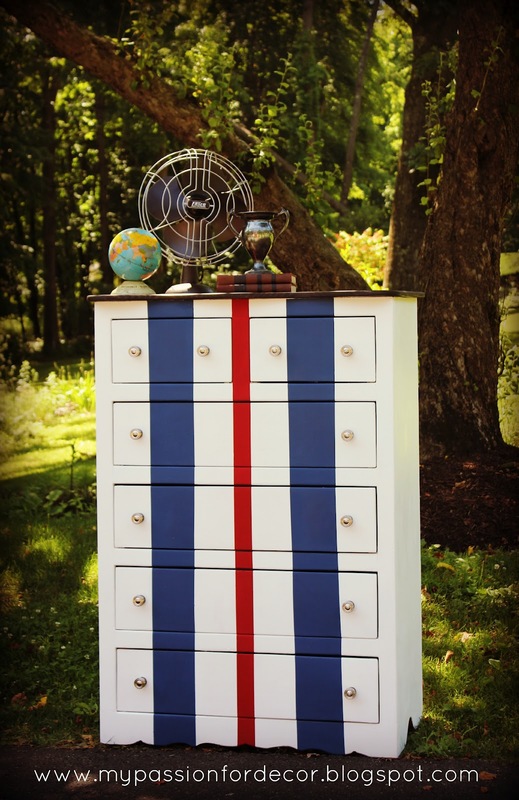 The more I looked at this dresser the more I knew I would use this for Hunter's play room instead. 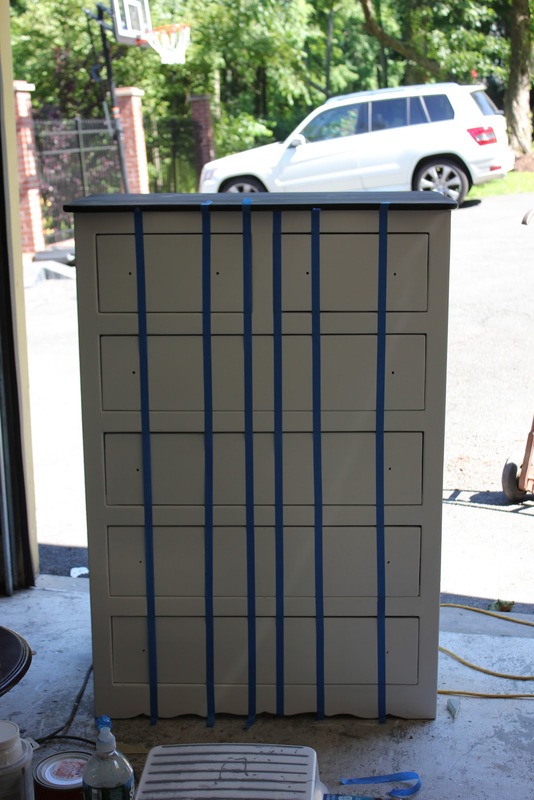 It has tons of drawers for storing toys. Once I determined I was going to keep this and not sell it I knew what I wanted to do to it and I couldn't wait to get started! 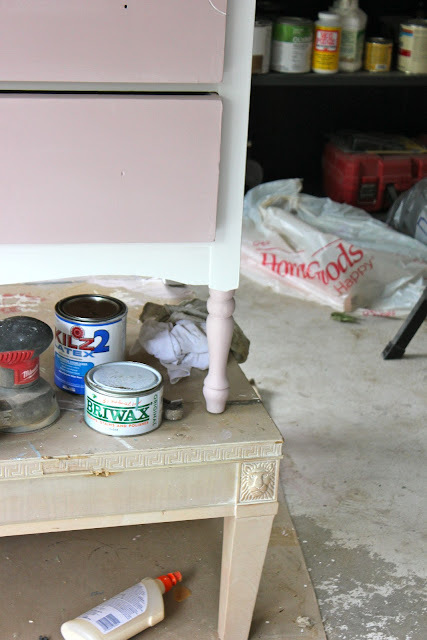 Such a change of speed from doing Elle's Dresser and being all girlie and pink earlier in the week! I sanded the top down really well so I could stain it. The sides I only sanded to smooth down the carvings and scratches. I didn't want it super smooth, but smooth enough that they weren't noticeable. 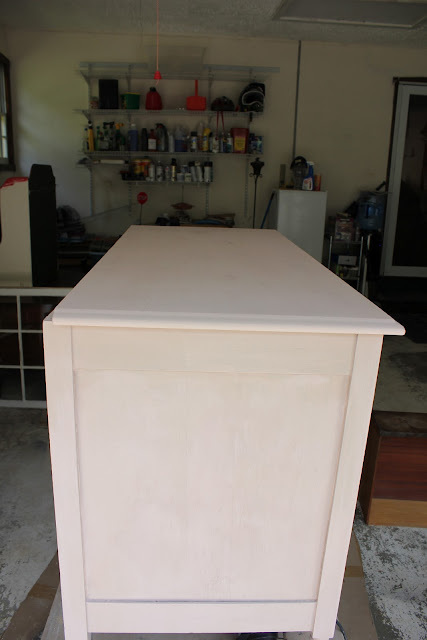 I painted the entire thing, except the top in Annie Sloan Pure White. I love her white paint. It's so think and goes on really well. I did 3 coats of paint. Yep that's a lot of paint, but remember this is going in an almost 7 year old's play room. I wanted it to have lots of coverage. Hunter LOVES anything car related. He has more Hot Wheels than any kid I know and plays with all of them. Thankfully not at the same time! I knew I wanted to do a race car inspired dresser, but not a literal interpretation. 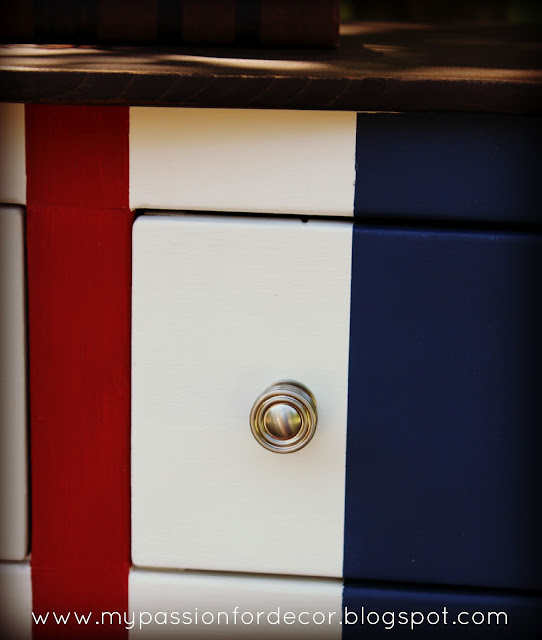 Hunter's favorite colors are red, white and blue (funny for a Canadian kid!) and he had requested I do the dresser in these colors. Originally he had said he wanted me to paint an American flag on the front, but I figured over time he'd tire of that. I decided to do my version of 'racing' stripes instead. I knew this would have longer staying power with a little boy versus a flag. So I started taping off the stripes. 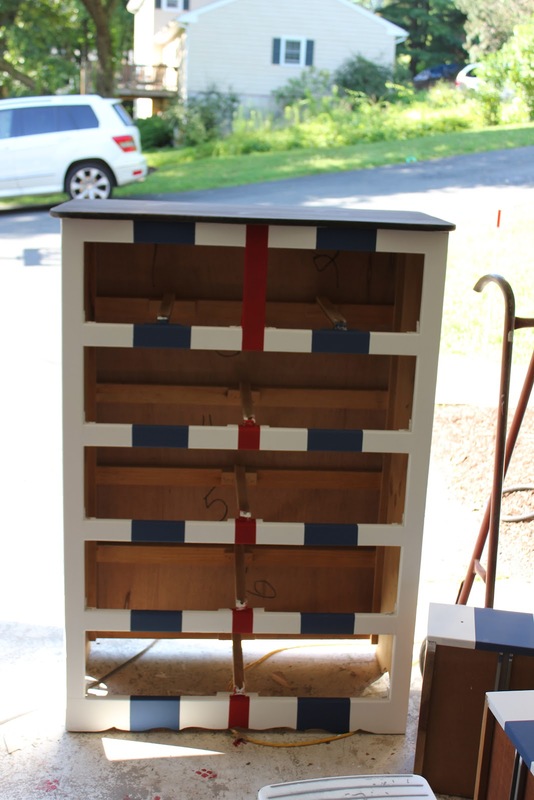 I wanted one more narrow stripe down the middle and two wider stripes one on each side. I have to mention here that I REALLY don't like taping off stripes. I did measure at points, but then just eyed it and went for it. I measured when I was done and I wasn't too far off. 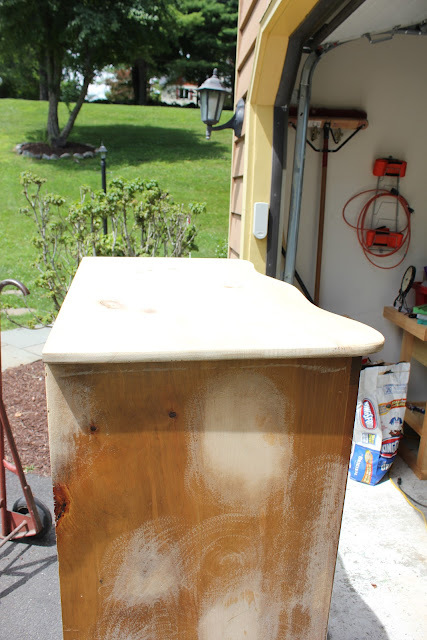 I forgot to mention that I stained the top. I started out with Jacobean, which I have determined after trying it on at least 4 different types of wood, is not my favorite. Then I topped it of with a coat of Kona. I wanted it to be dark, but I wanted to still be able to see the wood grain a bit. 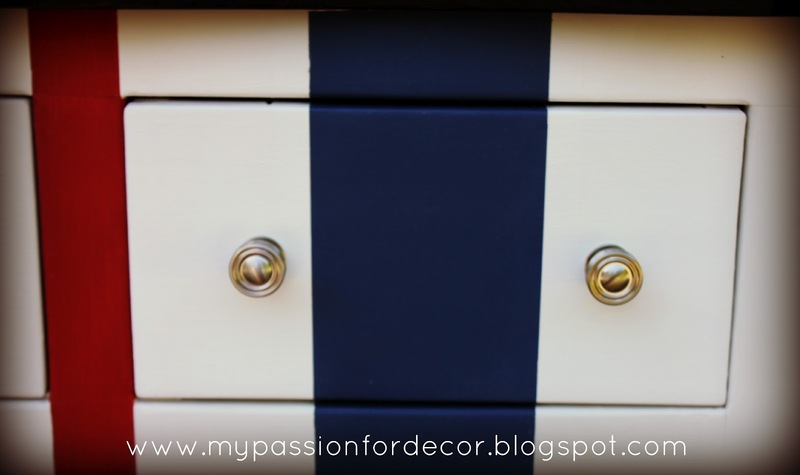 As requested by Hunter I painted the middle stripe in Annie Sloan Emperor's Silk, then the two stripes on each side in Napoleonic Blue. 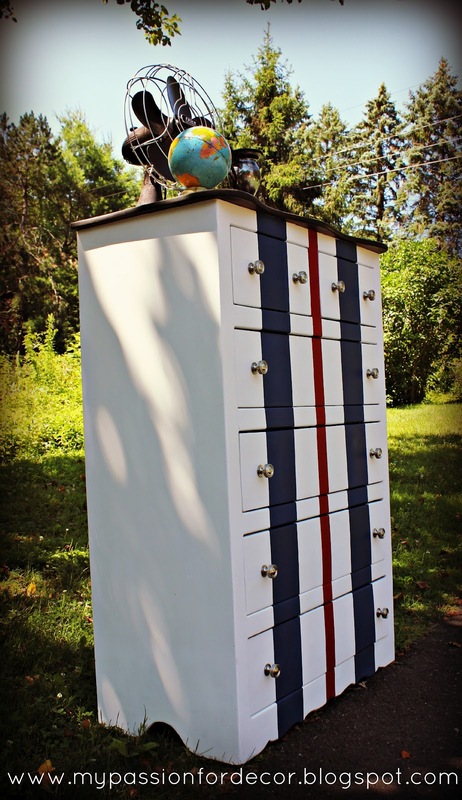 I LOVE the Napoleonic Blue! If you have a boy and need a navy blue this is perfect. It's a gorgeous shade of dark blue. 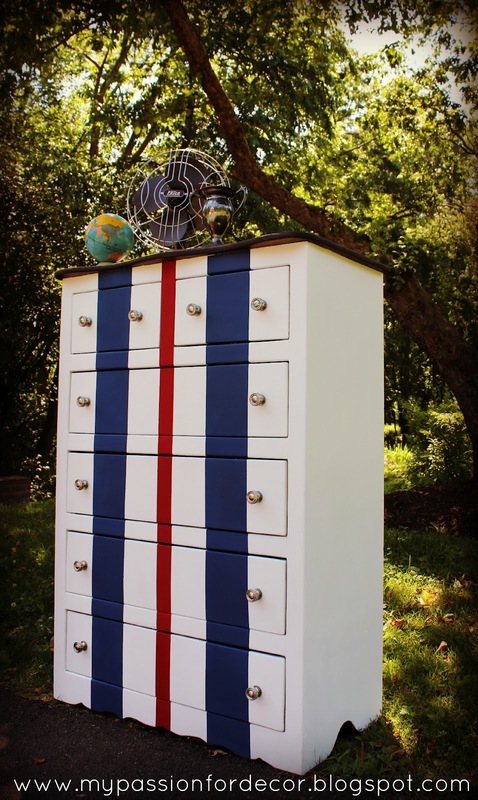 I painted the stripes on the drawers and the body of the dresser separately because I wanted the stripes to carry on to the drawer tops and bottoms, then inside the dresser openings. Here it is all painted, touched up, but not waxed. Notice there's no drawer hardware on yet. 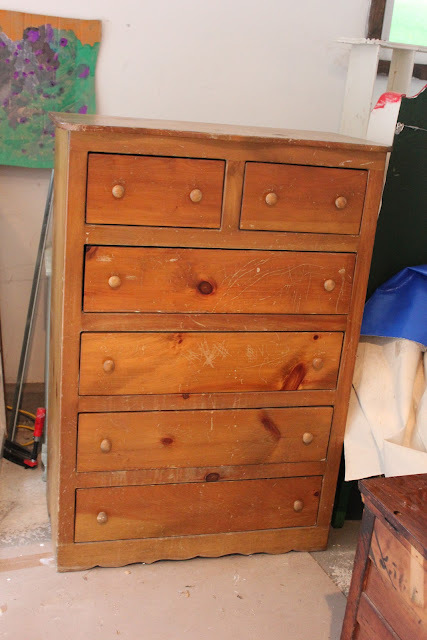 I had thought I could put the original wood pulls on after I painted them white, but that just made the dresser look unfinished. I took a ride to Home Depot, looking a hot mess, and found the PERFECT drawer hardware for this race car inspired dresser! It really reminds me of one of those cool 1960's Corvette's my neighbor used to have when I was growing up. I like how the dark top pops off the white and looks so great with the red and blue. Here's a close up of the drawer hardware. When I saw them I said out loud in the aisle at Home Depot "OH MY GOSH! Those look like wheels!!!" I think they're the perfect accent for this race car inspired dresser. I've received a few emails asking me where I find my accessories for staging the pictures. 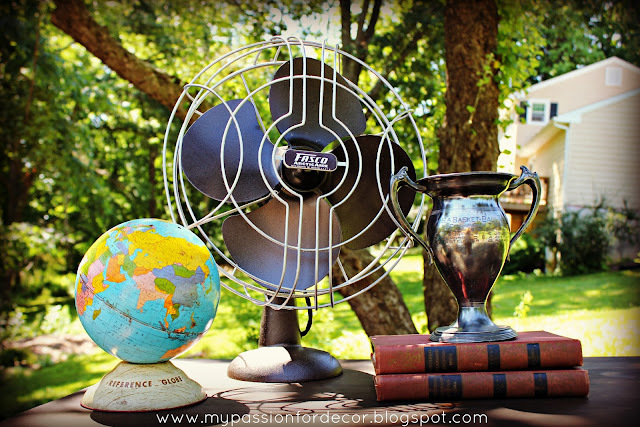 I have bought a lot of my stuff at our local outdoor flea market. A lot of it, like the Eiffel Towers (I have TONS of them!) I've accumulated over time and I got a lot when we went to Paris last summer. A good place to look for things is your local thrift store, flea market, antique store or even Home Goods or Home Sense (Canada). 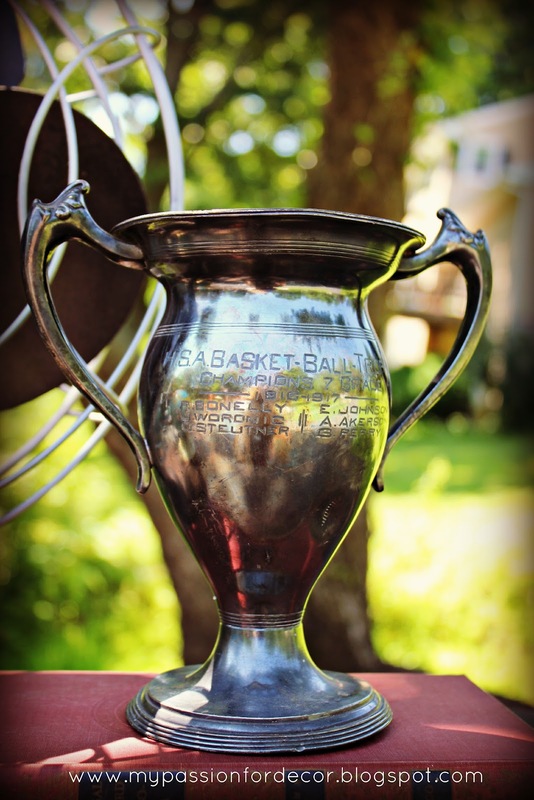 One of my favorite pieces I've purchased lately at the flea market is this basketball trophy from 1916. I think it's so cool, plus it was only $5! I've been doing a lot of pieces for other people lately and I LOVE what I do, but it was so much fun to do something for my special little man. Yesterday when he came home from camp he said, "Mommy you're the best Mommy in the universe and I'm so happy you're doing such a good job on my dresser." Doing something for the ones we love is truly what life is all about. Redoing this dresser for him after getting such a generous gift from a stranger only seems fitting. It would have been wrong to sell it and not pass on the gift to my Son. I can't wait to see his face when he gets home!! 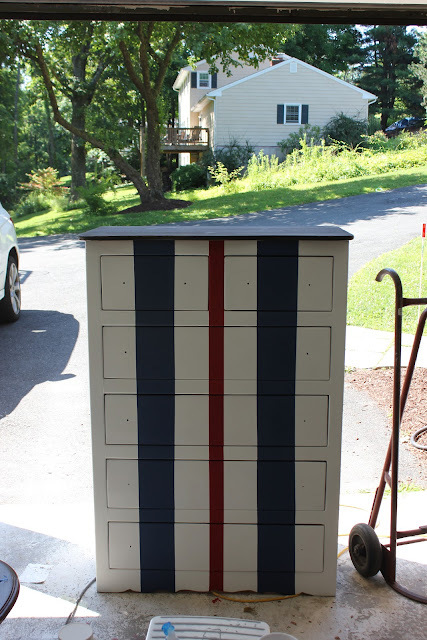 A few weeks ago I bought a dresser on one of my favorite tag sale sites on Facebook. 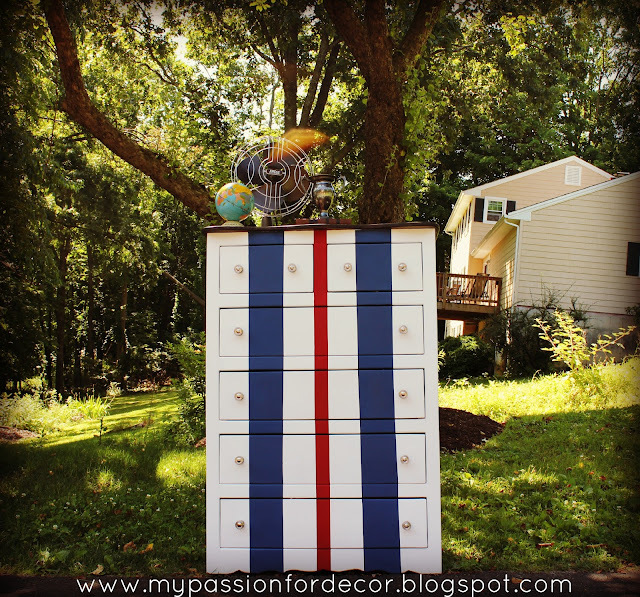 I loved this dresser because it had the lines, long curvy legs and details I always look for in a great piece of furniture. 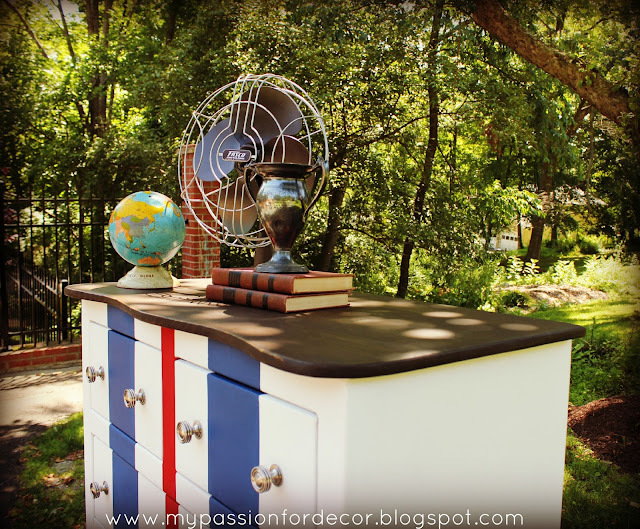 At the time I didn't know what I would do to the dresser, but I knew I had to have it. The same weekend I picked this dresser up a friend of mine came by to drop off a piece of furniture for me to work on for her mother (Biggest Challenge Yet). While she was here she was talking about how she needed a dresser for her Daughter Elle's room. They're moving into a much larger house from a small townhouse so they have lots of fun decorating to do! I showed her the dresser I had just picked up and she loved it. Over the next few weeks we talked about what color she wanted to paint Elle's bedroom, the color of the bedding, etc. Elle's bedding inspired me to do another dresser the Cherry Blossom Dresser. 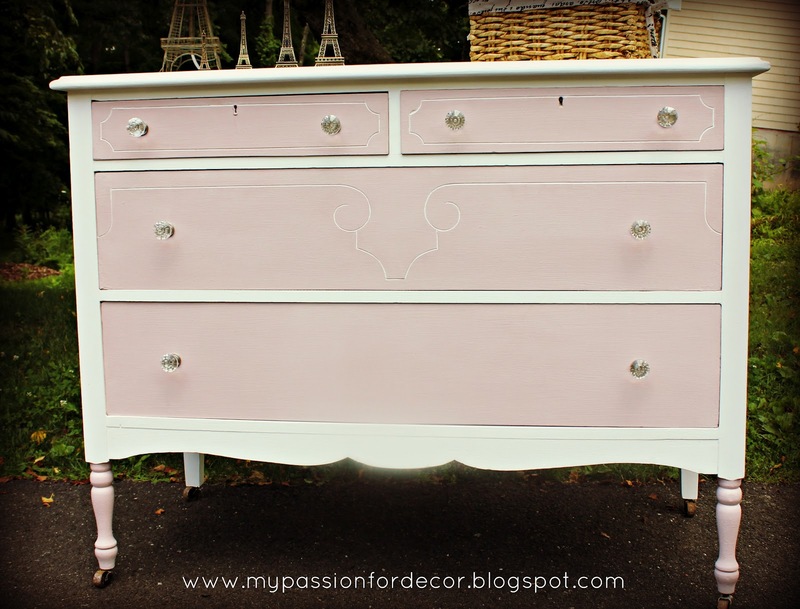 The entire time I was painting the cherry blossom dresser I was thinking about this next dresser and was excited about the fun I could have with it! 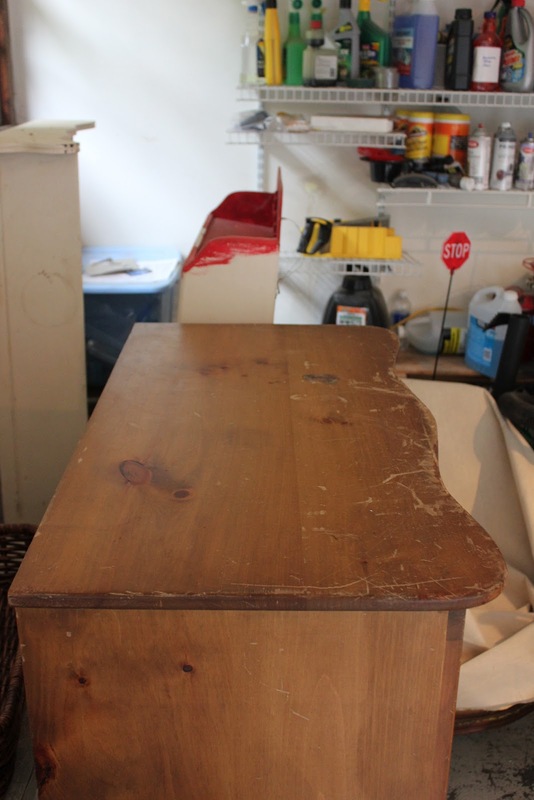 Here's what the dresser for Elle looked like when I brought it home. 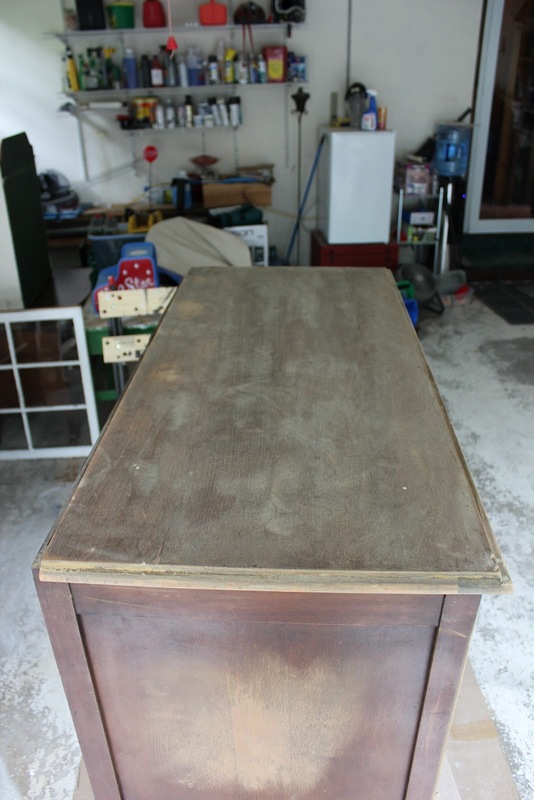 The dresser was not in the best of shape as you can see. The veneer was peeling off in parts, the top was a mess, but it still had all those fantastic details. 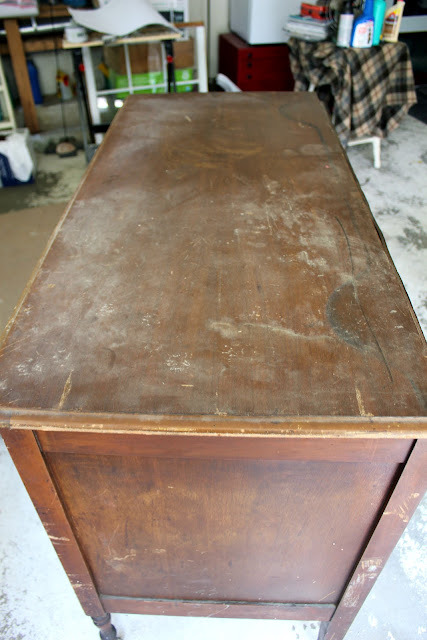 Even with all the dirt, peeling veneer and scratches it's a beautiful piece of furniture. Each one of the drawers had to be glued and clamped because they were falling apart. Then the veneer had to be filled and sanded in quite a few spots. 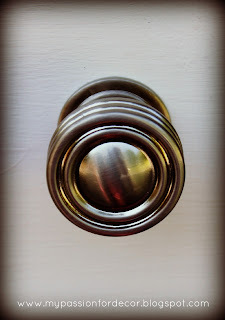 There were a lot of places around the knobs that had to be sanded down. There was some gunky old varnish, which would have been fine to add texture, but that wasn't the look I was going for. This was going to be different. 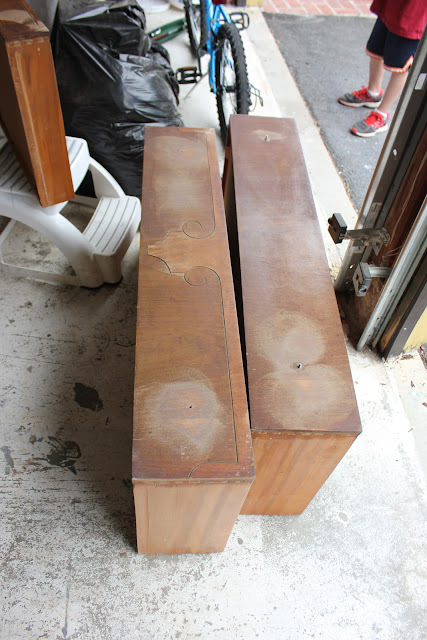 I sanded down the scratches, nicks and gunky veneer to give it a smooth surface. 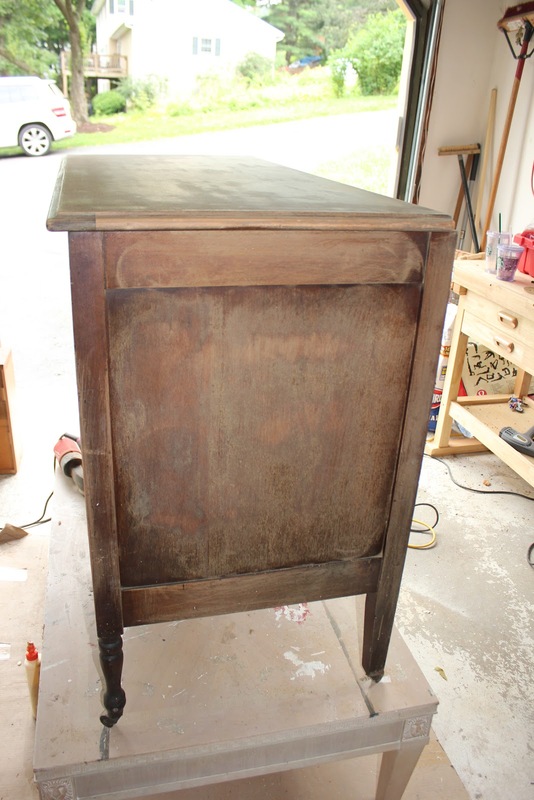 The top needed a lot of sanding because it had a ton of gouges in it. 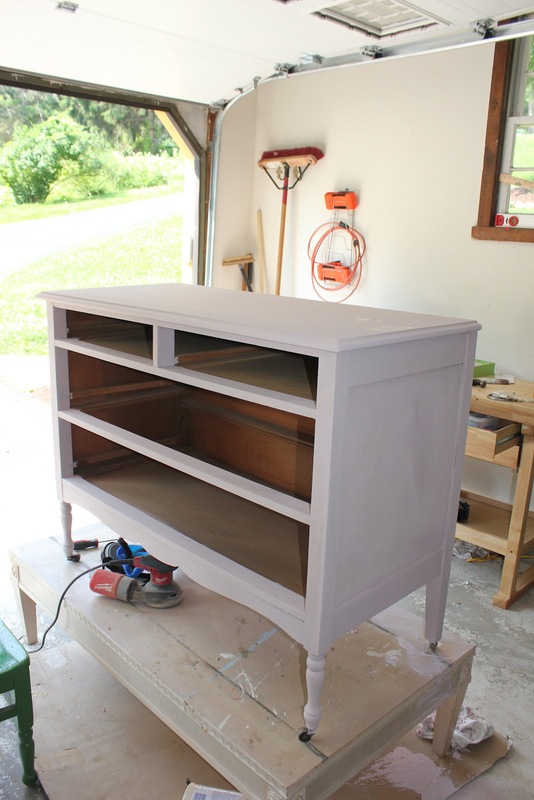 My friend had originally wanted the dresser to be distressed so I started out painting a different color underneath so it would show up with the distressing. 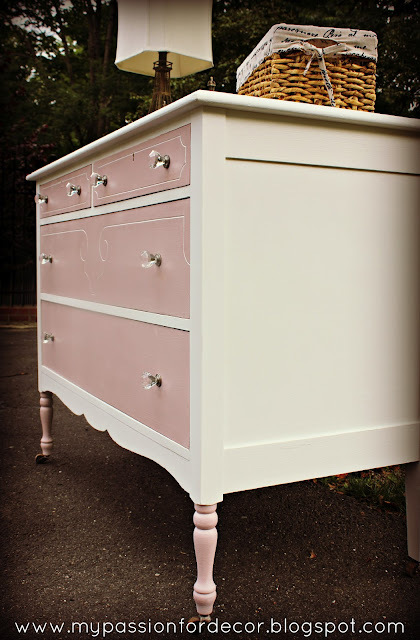 We had decided the body would be Annie Sloan Pure White and the drawers would be Antoinette. I was THRILLED because having a boy I never get to play with pink! This was exciting for this girlie girl. 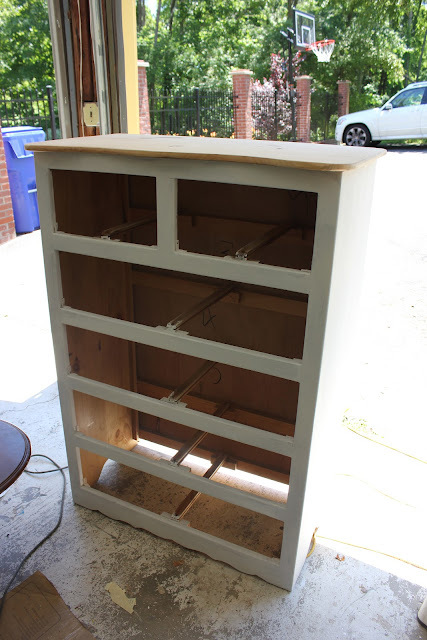 Like I mentioned before my friend had wanted to dresser distressed and I agreed that would be a great look, until I was finished painting. 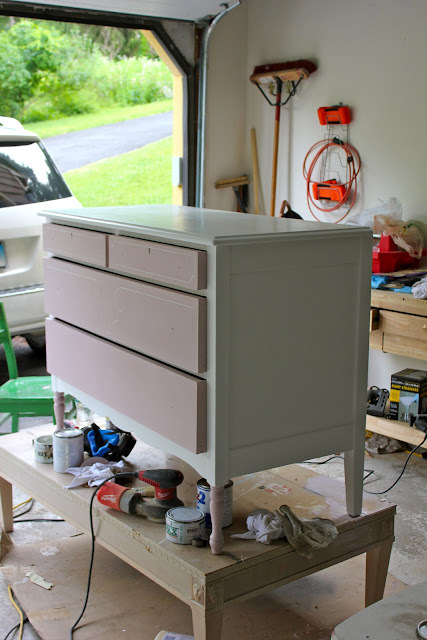 I knew I wanted to paint the insides of the curves on the outside of the drawers in Pure White to pop off the Antoinette. Once I was done doing that I couldn't bring myself to distress it. 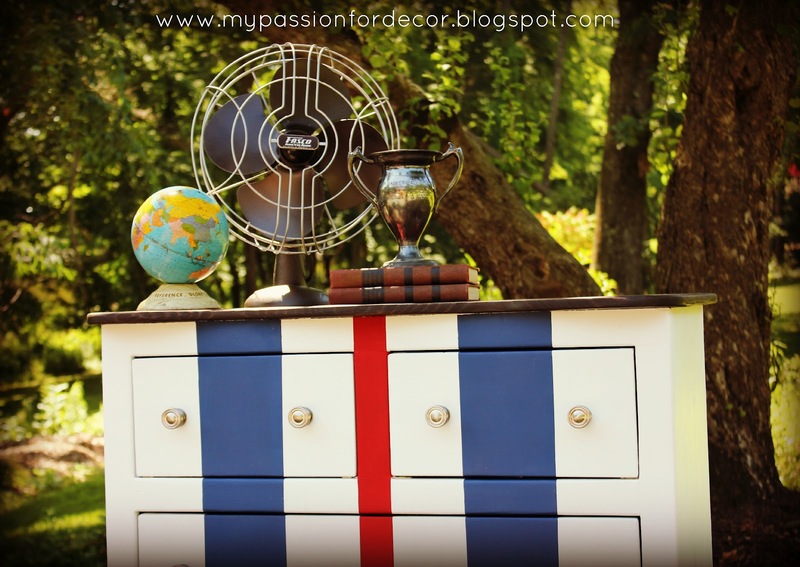 I love to distress furniture, but something told me, "DON'T DO IT!" So I listened to what I hope was my gut and not me losing my mind. Here it is all painted and coated in clear wax. The only thing she is missing are her jewels or what some might call her drawer hardware. 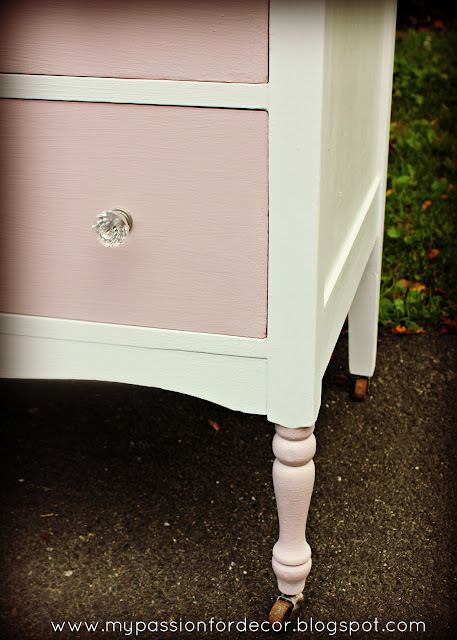 I painted the legs in the Antoinette color as well, just to show them off. I LOVE, LOVE, LOVE how the details in the drawers pop now! 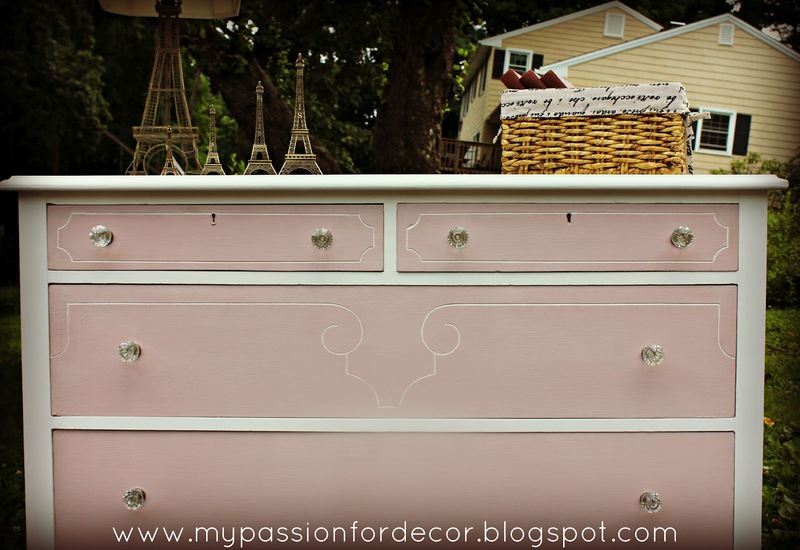 It's such a pretty and feminine dresser it makes me feel all girlie inside. Today we had a break in our monsoon type weather and I was able to take her outside, put on her jewels and give her a nice photo shoot. She's absolutely breathtaking don't you think?? The whole time I was painting this dresser I knew I wanted to stage it in a Parisian theme. Today I had to stop at Home Goods to pick something up and just happened to stop in at the lighting section. This is a bad thing for me because I have a bad lamp addiction. I found this Eiffel Tower lamp and had to have it (sorry honey!). It's Perfect for this dresser and my new Make Up Table! This dresser is made for a Princess and I think my Elle is a very lucky little Princess! 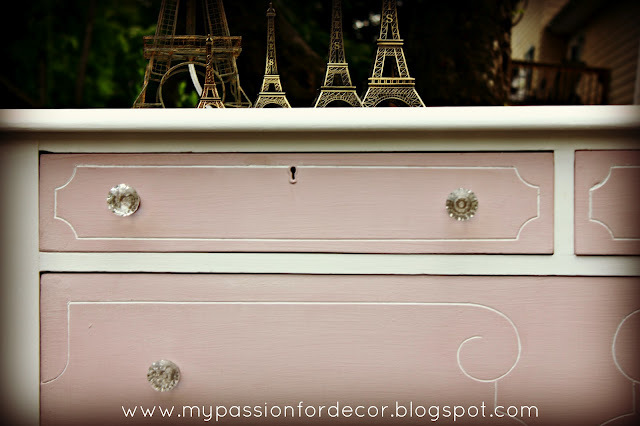 The drawer hardware is just what this dresser needs and really compliments the Antoinette pink. Maybe it was the fact the name of the paint is so French, but last week I found this scented liner paper at Home Goods and knew it would be the perfect French finishing touch. I can't get enough of those legs or the casters! 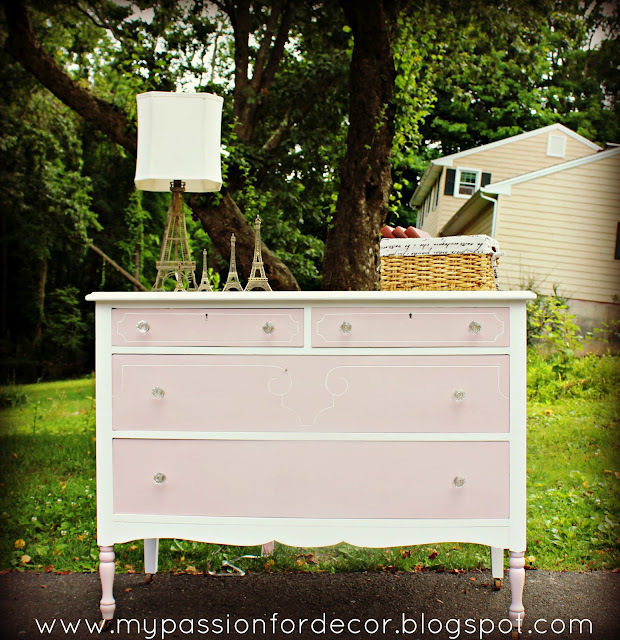 Every moment of redoing this dresser was fun for me. 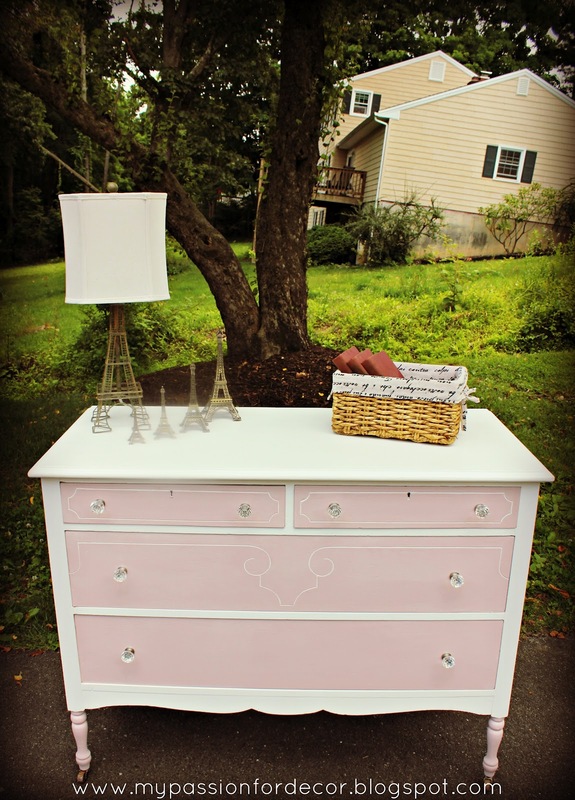 Knowing there's a sweet little girl that's going to enjoy having this in her room made it even more special. 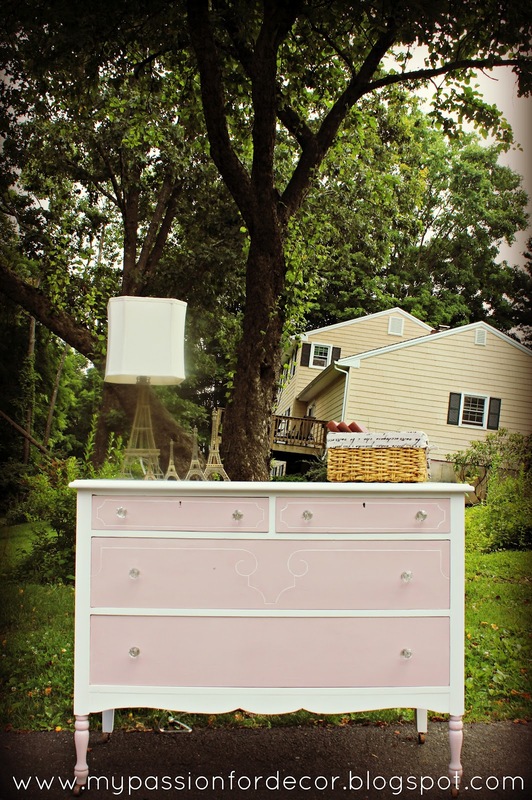 This is definitely a dresser made for a Princess. I hope Elle loves it as much as I do. 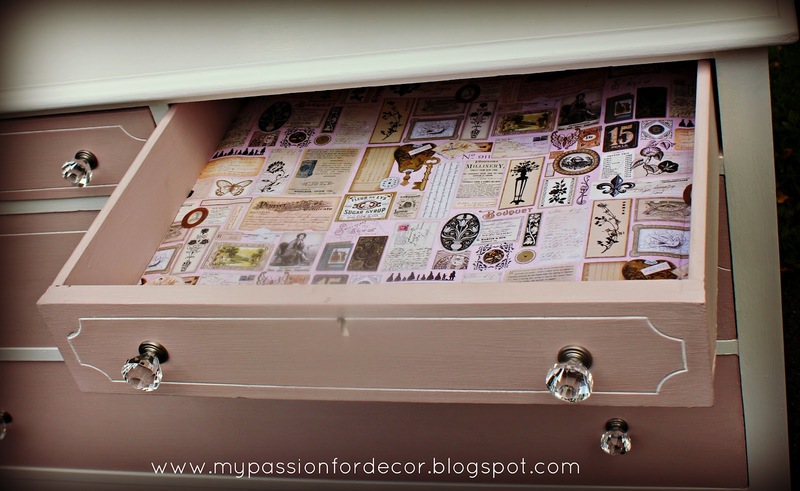 I really hope there's more painting with pink in my future! Let me know what you think. I love all your comments and I do take the time to respond to each one.